BE MORE PRODUCTIVE: Proper lighting is a must in any environment. With our magnetic work light, you will have a far-reaching spotlight when you need it, and a working light (flood light) when you want it. And now with our FREE Rechargeable Mini Keychain Light, you will have a light source in your pocket! GET LIGHTING ANYWHERE AND TO ANY DIRECTION: With the provided hooks, magnets, and articulated base you will be able to place this flash light in any position in any scenario! Working on a machine? Use the magnets. 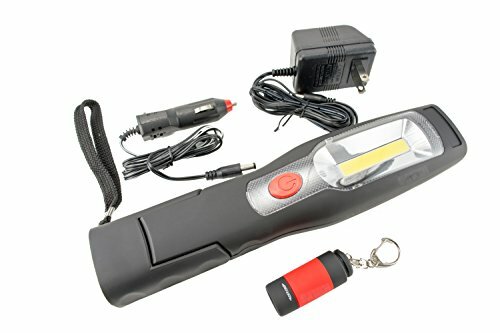 Your camping tent needs light? Use the hooks! SAVE HUNDREDS OF DOLLARS: Exchanging batteries is an unnecessary and expensive pain. With our exclusive flashlights combo, never worry about replacing a battery again. With the included accessories, you will keep them charge at home or vehicle. Between charges, our integrated lithium battery last longer than any flash lights with conventional batteries. LAST FLASH LIGHTS YOU WILL EVER NEED: Even when dropped by accident, it won't break easily! Pick it up and get back to work! These lights are made to stay bright and operational. If you have any questions about this product by SuiTech, contact us by completing and submitting the form below. If you are looking for a specif part number, please include it with your message.